Can anyone please tell me what I need to do to get NIK Collection to work? Photoshop plug-ins support is still under development. Some plug-ins are not yet working correctly. - HDR Efex Pro 2 (this one can only be applied to a single image/layer. There’s no interface to access the Image Selection Dialog nor to the Nik Selective Tool to load an image set). MEM.. I need to learn how to install plugins. Please guide me. Do you already have some plug-ins installed (in Photoshop plug-ins folder for example) or are you starting from scratch? Chuck, did you notice if your active layer is a "Pixel" layer? I get this message for all of the plugins including the ones listed by MEB below as working. And, yes the layer was a pixel layer. Make sure you are running the latest version of Affinity Photo (1.4.1) and the latest version of the Nik Collection. I am using Affinity Photo 1.41 and NIK 1.2.11_10. You were right, sir. 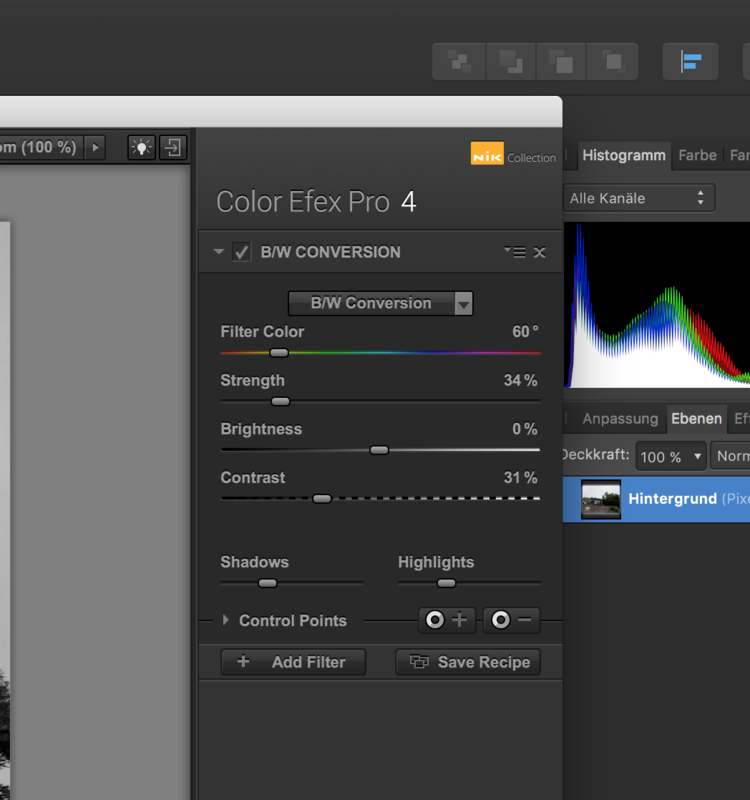 I have found that Color Efex Pro4, Analog Efex Pro 2, HDR Efex Pro2, and Silver Efex Pro 2 do work! Dfine 2, Sharpener Pro 3 Outside, Sharpener Pro 3 Raw, and Viveza do not work. Hope Affinity Photo will solve this problem. The gentleman in the video us demonstrating adding plugins in an older version of AP. I would just like to be able to continue to do any extra editing in PS CS5, as is done from LR 6.4. Are there instructions for this procedure anywhere? I have a screen capture and do not see a way of including it. I downloaded and installed the NIK collection of plugins by followed the video instruction. In preferences most of the Nik Plugins listed are listed with a yellow "Unknown" next to all Plugins except Analog Efex Pro 2 and Color Efex Pro 4 which both state "working" in green. I check "allow unknown plugins" but get the same message that Chuck got (in previous post). I did have a pixel layer selected. Are These NIK plugins not truly supported by Affinity? If they are how do I get them to work? Any info offered would be appreciated. 1. Is the file you downloaded named "nikcollection-full-1.2.11.dmg"? 2. Did you create an empty folder somewhere in the Applications folder prior to running the installer & add that to the installer's list of install locations? 3. What message do you get when you try to run any of the four plugins that work with Affinity Photo (refer to the earlier post by MEB for the list of those that work & those that don't)? Nik Collection, the actual version, won't run under OS X 10.11.4 with Affinity Photo 1.4.1.. Also Topaz brings Problems — won't start, 16 GB RAM are not enough. Deinstallation and new installation from the Pug-Ins don't help. I've a 2014 iMac Retina. I don't know what you mean by "actual version," but all the stand alone application versions of the Nik collection run fine on my iMac (which is running OS X 10.11.4) & the plugin versions of the ones MEB mentioned in the second post above all work fine with AP version 1.4.1. There may be something wrong with the Plug-ins config in Affinity Photo. Can you please post a screenshot of the Photoshop Plug-ins dialog (Preferences) so i can see how you have configured it? Das ist leider nicht hilfreich. Affinity kommt nicht an die Autorisierung heran, die die Nie Collection automatisch installiert. Hier ist noch anzumerken, dass der Rechner komplett am 24. März neu aufgebaut wurde. Davor hatte ich auch keine Probleme. Diagnosetools können keinen Fehler auf der Festplatte feststellen. Im Demo Modus laufen die Plug-Ins der Nie Collection! Es leitet also an den Plug-In Support Daten. Das letzte Bild zeigt den Demo Modus der funktioniert. I suspect you are having problems because you have installed an older demo version of one or more of the Nik tools. On March 24th, Google made the entire collection free & available as a single download. 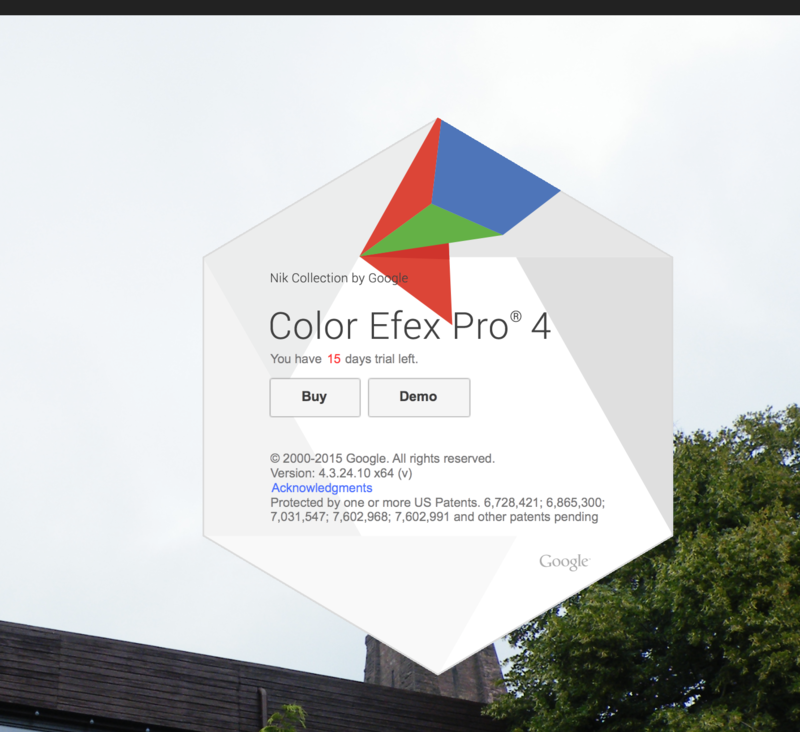 To get the free installer, go to https://www.google.com/nikcollection/, click on the blue "Download" button near the top of the page, & select "Mac" from the popup. That will start the download. You probably need to uninstall any individual demo versions you have installed first, but after doing that follow the instructions in the "Google Nik Collection is now free for everyone" topic (https://forum.affinity.serif.com/index.php?/topic/19182-google-nik-collection-is-now-free-for-everyone/) to install both the plugin & stand alone versions. Sorry folks but all this rumbling about Photoshop plugins installation is good for nothing ... Can anyone PLEASE post simply as 1-2-3 ... "good-recipe" how to do it? I've bought Affinity Photo, thinking it was as powerful as Photoshop. My first try, using Nik Software : absolutely no Nik plugin is working ! I have the last version of the both AP 1.6.2.97 and Google Nik Collection 1.2.11. All of them are shown yellow "Unknown" ! So, it's not a good to say AP is working like PS. It's been 1,5 year since the last post and nothing has been done to solve that matter. So, what does AP suggest ? 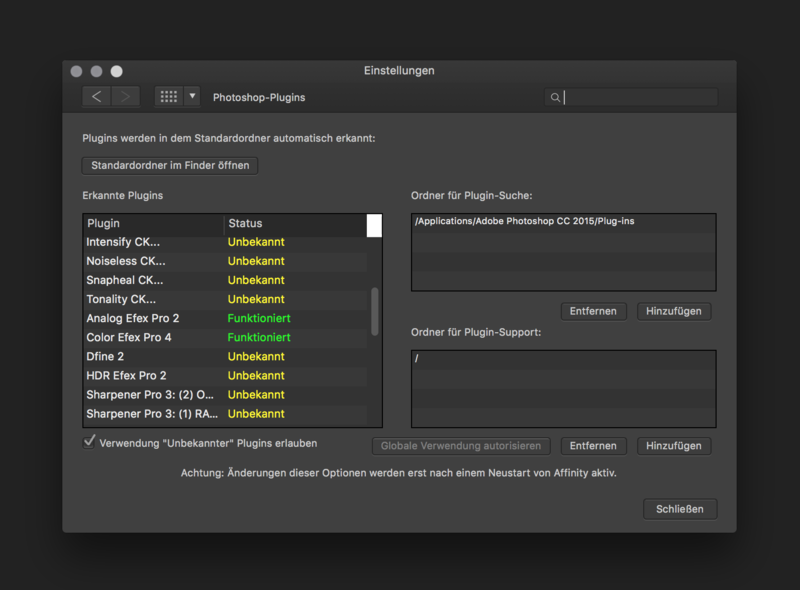 Go to Affinity Photo Preferences, Photoshop Plugins section and tick the Allow "Unknown" plugins to be used checkbox.